Now, this post is probably one of the most mechanically interesting and robotically entertaining posts I’ve shared with you in quite awhile, and it’s also got me thinking about a few things. 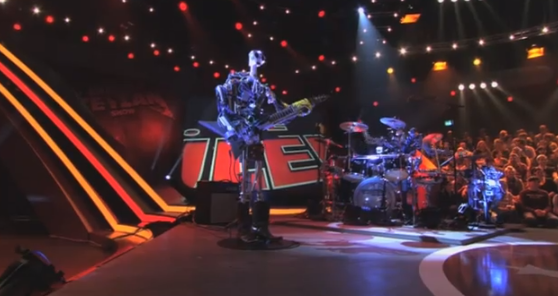 The band is called Compressorhead and to be honest their live performance is a bit robotic. But that’s a good thing because these dudes are creative bunch. Well, at least the guys who created the band are creative. Watching this video reminds of going to showbiz pizza as a kid and watching the animatronic bears move and sing as I scarfed down pizza and soda. But thinking of this sort of thing in a live music context really fascinates me, and it takes things to a whole new mental, physical and emotional level. And, according to this link, Compressorhead has made a recent live appearance at the Big Day Out festival too. And they have a fan club called the meatbags. I also wonder if this is what Daft Punk had in mind when they wrote the “Robot Rock.” Wouldn’t it be cool to see Compressorhead and Daft Punk do a show together. Speaking of creative shows, what about putting Compressorhead with Tupac to evolve our sci-fi gangsta rap exploration, or maybe invite Japanese artist Hatsume Miku to do vocals and add a bit of pulsing electro-pop to the mix? And considering our exploration of heavy metal in the Middle East I wonder how Compressorhead would be welcomed in that part of the world? And could these guys cause a riot like Metallica? And what if we did an experiment to compare the emotional response to a Compressorhead show versus a live human band? What would we discover? Would the emotional response be different? If so, how? The possibilities and creative wonderings are endless, really. Check out the video above and more videos here, and let me know if you would go see Compressorhead live and if you would like to see more of these types of bands. If you’ve seen them live, drop a comment and we’ll share your story on a future episode of Live Fix Radio. This is just the beginning of our Compressorhead exploration and stay tuned for more!